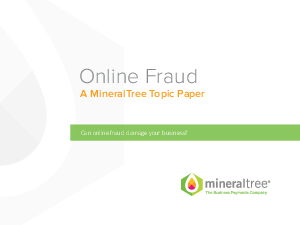 > MineralTree > Can Online Fraud Damage Your Business? Yes, your company is a ripe target for fraud - but it doesn't have to be. Cybercriminals love small to medium businesses, since they have more money in their bank accounts than individuals, but often lack the sophisticated technology and vigilant processes of larger organizations. Gartner estimates that more than 10 percent of small businesses have had funds stolen from their bank accounts. Download this topic paper on online fraud protection for businesses to learn more.